The quarter inch overlap is a key part of custom picture framing, but it is often either unknown or overlooked which can cause some confusion. 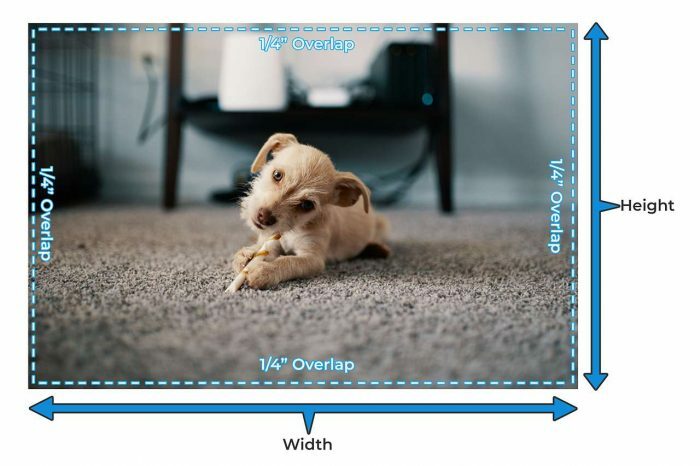 What is the 1/4” overlap & why do we need it? 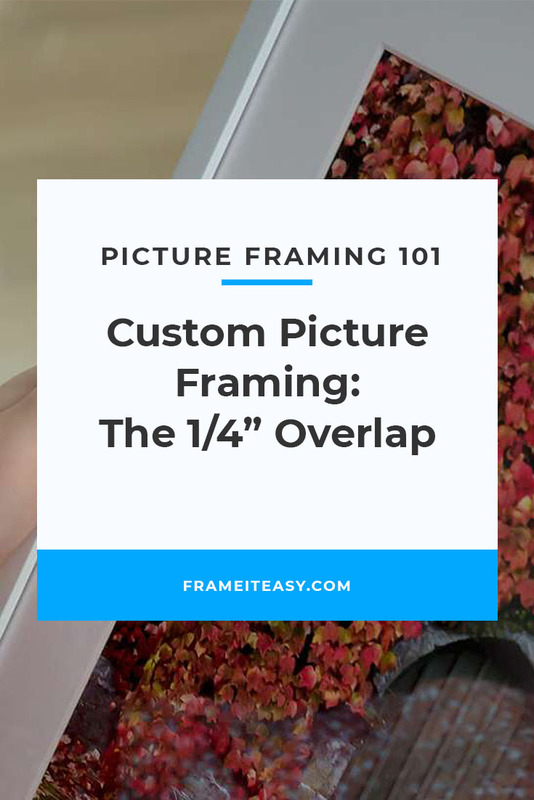 In custom picture framing, the 1/4” overlap is the measurement of your art that will be covered by its frame or matting. Without this necessary overlap, your art would fall through the opening of its frame — it needs to be held in place by some sort of material. Ever try holding something in your hand, but didn’t have a good enough grip on it? If you have, most likely you recall the object you were holding falling to the ground. The principle is the same with the overlap; it has to grip enough of the photo, or else the photo will slip through the opening of the frame, which is not a result anyone wants! In most cases you don’t even need to worry about the overlap when measuring your art, other than acknowledge it exists and understand the purpose it serves. This is a common concern we hear as concealing a signature or detail at the edge of your print could ruin the overall appeal. A way to lessen the overlap is to add 1/4” to your “Art Size,” making the overlap 1/8″. So, if you had an 8” X 10” print, and wanted to make the overlap only 1/8”, you would enter 8 1/4” X 10 1/4” as your “Art Size.” This will make the exact opening of your frame 7 3/4” X 9 3/4”. Just note that since this gives a little less margin for positioning, you will need a way to secure the artwork to the backing so that it’s positioned within the frame the way you want. We suggest using Framer’s Tape, which won’t hurt your artwork, is acid-free, and can be removed easily with slight heat applied. 1/8” is the smallest overlap that we recommend. Sometimes, art encompasses the entirety of a surface, and some people don’t want any overlap. 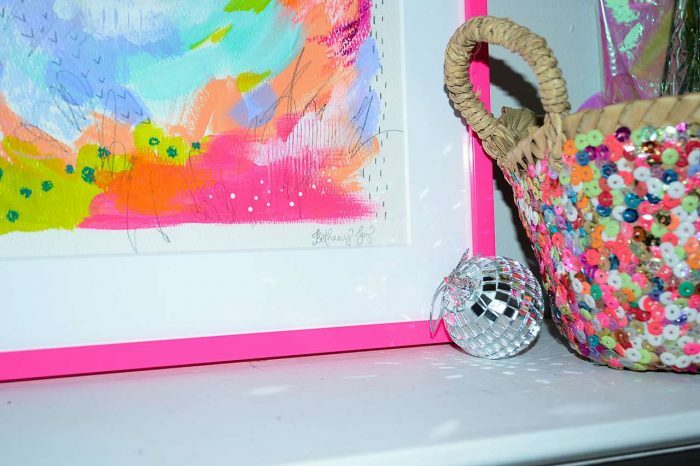 This, however, isn’t conducive to making a functional frame, and it essentially reduces it to being a decorative border around your artwork that you’ll have to find a creative way to work around. If you acknowledge that, and still want to go this route, you would add 1/2” to the “Width” and “Height” of your “Art Size.” This would negate the overlap. If you have an 8” X 10” print, and order an 8 1/2” X 10 1/2” “Art Size” frame, the exact opening will be 8” X 10”. Keep in mind, however, that you would likely need Framer’s Tape to secure your artwork in place if you decide to do this, but even with these suggestions, it’s very likely that you’ll see the backing peeking around the artwork despite securing it in place — it will be very difficult to position acceptably with no margin for error, thus we don’t recommend doing this. Matboards can slightly change the necessity of an overlap, but don’t negate the need altogether. Matboards themselves don’t always hold artwork in place, but since they accent your art you want to make sure it still lines up properly. Framer’s Tape is usually recommend to secure art in place for frames with matboards. We still recommend an overlap for frames with matboards because, if there is none, there tends to be a gap between the edge of the artwork and the matboard. This would expose the backing slightly, creating issues. You could have the matting cover the border with no overlap on your art. If you want your border to be visible with your art, simply measure the entire piece of art — border included — and acknowledge it will have the regular 1/4″ overlap on the outside edge. 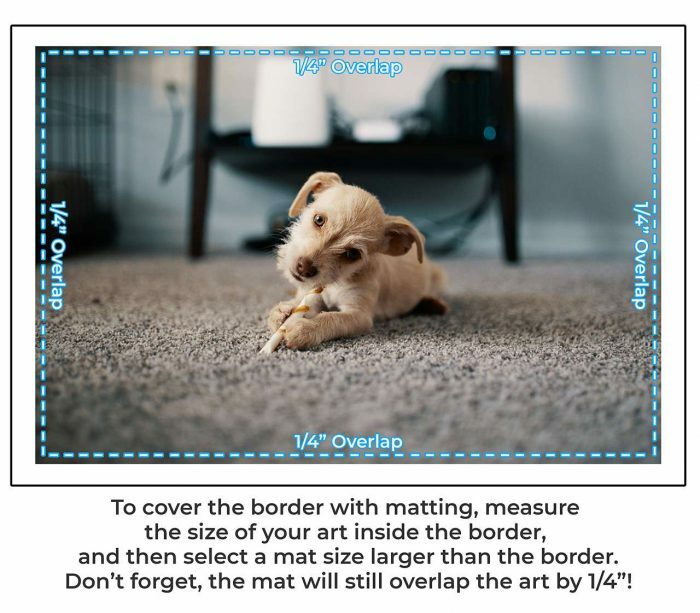 If you don’t want to see any of your border and don’t mind the 1/4″ overlap on the art itself, measure just the size of your art excluding the border, and choose any size matting as long as it is larger than the border width. 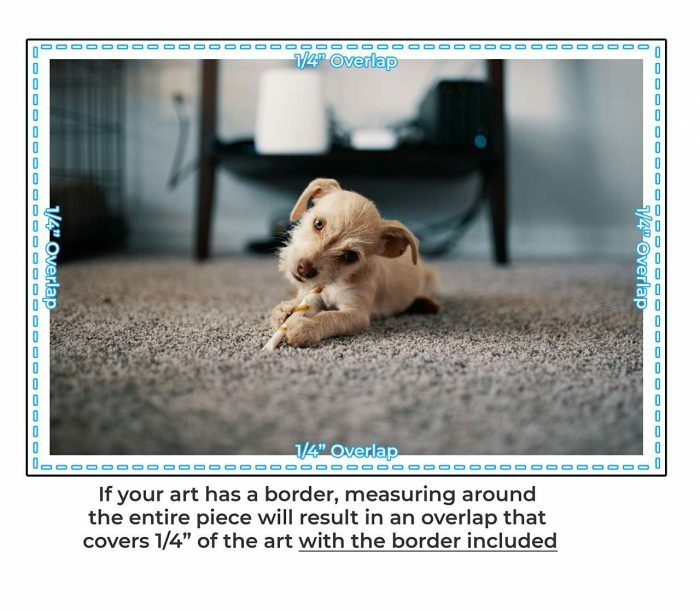 If you want the matting to cover your border but not overlap the art itself, you would measure the size of the art itself (no border), add 1/2″ to the art size, and select your matting in any size larger than the border width. For example, let’s say your print has a complete measurement of 16” X 20”, but the actual art on it that you want visible is only 12” X 16”. 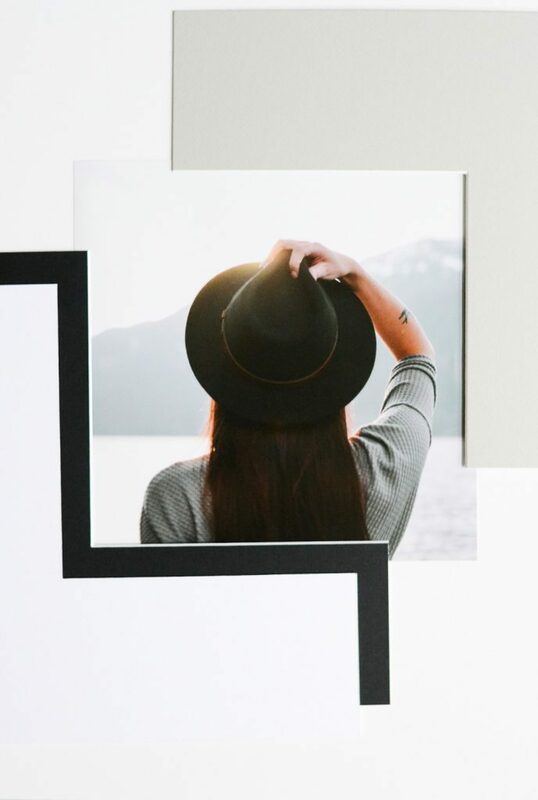 You could negate the overlap in this case, because you can put a matboard in the frame, and enlarge the frame so it will be big enough to fit your print, while still having a matboard that will display the image alone. 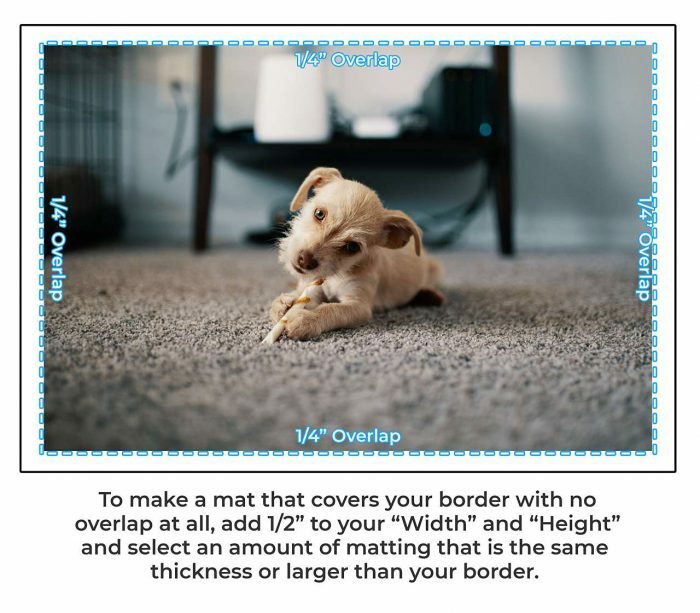 To do this, you would enter an “Art Size” of 12 1/2” X 16 1/2”, then you would go to the “Matting” section, and specify that you want 1 3/4” of “Matting.” This will make the opening of the matboard 12” X 16”, and the opening of the frame 16” X 20”. Your print would be fully displayed, and still held securely in place! Unless you specifically alter your Art Size dimensions to account for overlap, assume there will automatically be a 1/4” overlap applied to your frame. You can negate the overlap, but you 1. Run the risk of seeing your backing through the edges and 2. Would need Framer’s Tape to hold your print securely in place. Most matboards need an overlap, too, but for more aesthetic reasons. If your art has a border, it might not need an overlap.